Let's assume that you have performed a transformation (e.g. hashing, signing, encrypting) to document M. The transformation is proportional to the size of M. Now a small part d of the original document changes resulting in M'. This change in the original document requires changing the transformed document. 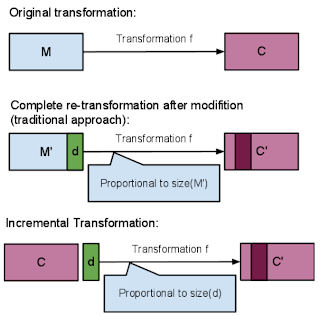 Are there techniques to perform the transformation that is proportional to the modified portion of the document (i.e. d) not M'? There is some interesting work done in this area. The idea was initially put forward by Ballare et. al. in 1994 and an improved version in 1995. There is some recent work on this area as well. Incremental cryptography is the topic explained here. The diagram give in this post helps you in understanding the idea behind this topic. I find this post useful in several ways. Incremental cryptography is very important topic. Thanks for this information.